Offering 99.9% uptime and complete access control to the admins, Linux dedicated servers are the best way to scale any online business. These servers offer the flexibility, scalability, speed, and uniqueness required to set your website apart from the rest. 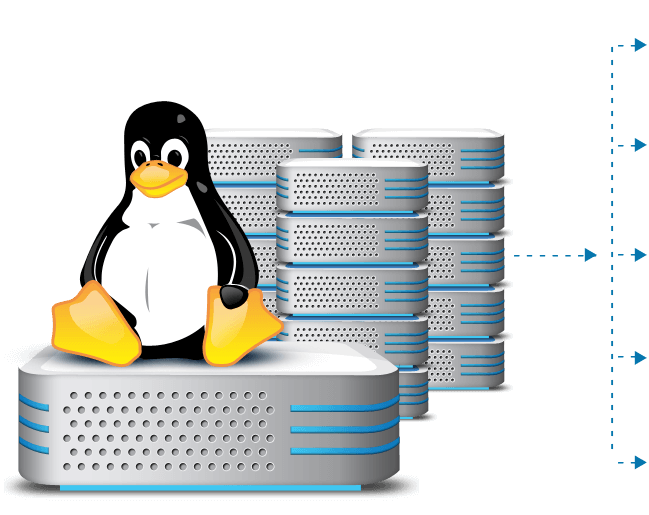 WeblinkIndia, a Linux dedicated server hosting company, excels in providing Linux server hosting and can easily provide a server to meet your exact business need. With our dedicated Linux hosting, you get to choose the operating system of your choice like CentOS Server, Ubuntu Server, Debian Server, etc. Our team of proficient experts studies your requirements, and offers you an option to pick, or upgrade to the operating system of your choice. Supported operating systems- CentOS Server, Ubuntu Server, Debian Server, etc. With our Linux server hosting services, you get full control over you Linux dedicated server via SSH. Also, the customers get the leverage to install any software or application of their choice on the server. Customers can install reboot servers, self-install/re-install/upgrade operating systems, access server console remotely, with HP iLo Remote Console. The use top-grade server hardware in our dedicated servers guarantees no failures in future. We replace the hardware or resolve the issue in case a problem arises, within 24 hours. Our clients enjoy unlimited bandwidth with fixed monthly bill, and no extra charges on exceeded bandwidth for any month. We offer our clients 24X7 technical support through our helpdesk/ Phone/ Email/Instant messaging/Skype, etc., even while offering cheap Linux dedicated server. Our proficient experts with over 10 years of experience possess an extensive expertise in working with CentOS Linux, Red Hat Linux, Fedora Linux, Scientific Linux, Debian Linux, SuSE Linux, Slackware Linux, etc. We employ intelligent security measures to make sure that your Linux web hosting server offers a functional and secure environment. The low-cost hosting with inexpensive licensing attracts many new marketers and small scale entrepreneurs to begin their business at relative cost with LINUX. This is perhaps the biggest reasons why LINUX managed to top the web hosting industry in a short span of time with ease. There are various Linux distributions available in the market to pick the one that suits your business requirements the best. The open source development environment of Linux offers budding developers the freedom of learning the ins and outs of the platform, along with thriving community support of the adepts. The open-source platform of LINUX is backed by a thriving community support of many programmers and developers that modify, enhance, and distribute the services to the public. The ease of use, and fast processing make LINUX “the favorite” of the industry giants situated worldwide. The platform meets all basic web hosting needs of the companies, but, LINUX’s functionality and performance could be further enhanced by installing Perl script, MySQL, AND, PHP, etc. Linux is acclaimed for its ability to run for years without any failure, and effectively handles processes running simultaneously better than windows. A secure hosting server became a vital need since major tech brands experienced online hacking or theft in past. As far as the security is concerned, Linux outguns other web hosting servers effectively, with its easy and secure software fixes, maintenance, and upgrade. We make sure that your Linux Dedicated Server is always up-to-date to meet the demands of the ever-evolving business landscape. Our Linux Dedicated Server supports all the distributions of Linux such as CentOS Server, Ubuntu Server, Debian Server, Fedora Server, openSUSE Server, Slackware Linux, FreeBSD Server. If your server is up and working properly, it can turn your website into a supportive business tool. We promise 99.9% uptime for our clients, so they don’t miss out even a single business opportunity. In our journey of 18+ years, we have built a reputation for delivering the projects on time, along with impeccable after sales services. We promise our clients 24*7 technical support through our live chat/phone/e-mail.